Arguing for the resolution will be one of the world’s most well-known populist thinkers and campaigners, Stephen K. Bannon. He served as the CEO of Donald Trump’s presidential campaign, helping to shape and amplify many of the populist policies that helped get President Trump elected. Speaking against the resolution one of North America’s leading public intellectuals, David Frum. He is a senior editor of The Atlantic magazine, and his most recent book, Trumpocracy: The Corruption of the American Republic, was a New York Times bestseller. 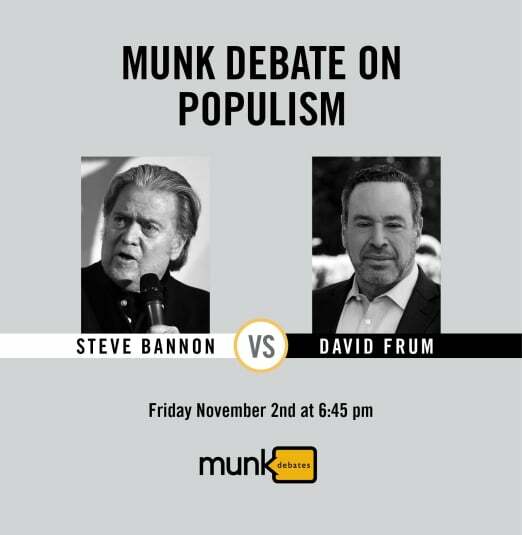 Tickets window for Munk Debate premium members is open from at 10:00 AM on Wednesday, October 10th to 10:00 AM on Friday, October 12th. Any remaining tickets will go on sale to the public at 12:00 Noon on Friday, October 12th. For information on subscriptions or premium membership, please visit www.munkdebates.com.